Aim: Ankylosing spondylitis (AS) is a chronic inflammatory arthritis mainly affecting articular and extraarticular structures. AS clinical manifestations also involve sacroiliac joints and spine. Genetic factors play a key role in AS susceptibility. AS-associated subtypes of human leukocyte antigen (HLA)-B27 and other HLA-B alleles vary in different ethnic populations. There are no reports of HLA B genotype association to South Indian AS patients. In the current study, we have analyzed the HLA-B genotype association with 105 AS patients and 100 respective controls, we have also verified whether any specific clinical manifestation of AS has any pattern of HLA-B subtype association. Methods: The patients with AS were diagnosed fulfilling ASAS criteria. Before enrolling the patients, the written informed consent was obtained. The peripheral blood DNA genotyping of HLA-B27 was performed in Applied Biotechnologies 3130/3500 sequencer using SeCore HLA B Class I typing high-resolution kit from Invitrogen. Results: HLA B27 allele frequency in AS patients (74%) is significantly higher than healthy controls (3%). Most of the earlier studies associated AS with HLA B27 antigen. The current data illustrate that only 21% of AS patients presented HLA B27 antigen. HLA B27:05 and HLA B27:04 are the predominant subtypes. Early-onset of AS manifestations is seen in HLA B27 phenotypes than non-HLA B27 phenotypes. HLA B27 associated AS patients presented more severe axial manifestations such as bilateral sacroiliitis, erosions, and extra-articular features such as uveitis than non-HLA types. Positivity for HLA B27 allele predicts more severe disease course in South Indian patients with AS, similar to that in other populations. Conclusion: The current study indicates that a majority of South Indian AS patients are associated with HLA-B*27 alleles. In addtion we found that HLA-B*27 associated AS patients presented with more severe axial manifestations. It is interesting to note that not all subtypes are associated with AS. In addition to B*27:05, most alleles such as B*27:01, B*27:02, B*27:03, B*27:04, B*27:10, B*27:13, B*27:14, B*27:15 are documented to be associated with AS. In Caucasians AS is associated with HLA-B*2701, *2702, *2705, *2708, and *2709, in Chinese, HLA-B*27:04 and in Mediterranean population it is HLA-B*27:02, whereas Asians have been associated with B*2704, *2706 and *2707. The subtype B*2706 is now known as B*2722 is a rare subtype identified only in some Southeast Asian populations and B*2709 in Sardinians are unrelated to the development of AS.,, In African–Americans and West African populations, B*2703 is reported. HLA-B*27:02 is the predominant allele among the Middle East and Jewish populations.,,, Even though there are few studies in India associating HLA-B antigen with population and clinical manifestations of AS,, there are no reports of HLA-B genotype association to South Indian AS patients. In the current study, we have analyzed the HLA-genotype association with 105 AS patients and 100 respective controls. We have also verified whether any specific clinical manifestation of AS has any pattern of HLA-B subtype association. The patients with AS were diagnosed following ASAS criteria. Age and gender-matched controls were selected randomly from healthy group; they were free of any history of rheumatic diseases. Consecutive AS patients were selected among those who have visited Rheumatology clinic during the study of 1 year. Rheumatologist evaluated all the patients and necessary radiographs, and clinical tests were performed to confirm the clinical status. The medical information related to patient history and disease status was collected. Patients with inflammatory low back pain for more than 3 months of duration with sacroiliitis on magnetic resonance imaging (MRI) were included in the study. Even though radiographic sacroiliitis was present, many of the patients had an MRI of the sacroiliac joint. Hence, all patients with MRI evidence of sacroilitis were included in the study. All the patients included were more than 16 years of age. Peripheral blood was used to analyze the expression of HLA-B27 antigen on the T cell surface by flow cytometry assay using monoclonal antibody specific for HLA-B27. Human Genomic DNA was extracted from peripheral blood using QIAamp Blood DNA Mini QIA cube kit. The B locus-specific PCR amplification was performed using GeneAmp PCR System 9700. The targeted amplicon size was ~ 1400 bp. The amplicons were enzymatically purified by ExoSAP-IT. The exon (2, 3, and 4) specific cycle sequencing setup was performed using the SeCore Sequencing IVD kit by Invitrogen. The nucleotide chronology and resulting HLA subtype was determined by multicolor, fluorescence-based, Big Dye and results detected on an automated ABI 3730 × l DNA analyzer instrument. The sequencing data were analyzed using uTYPE 7.1 with reference to recent IPD-IMGT/HLA database. Tests of association between genetic variants and AS were performed for each allele using SPSS version 20 (Chicago, USA). Exact P values were obtained (Fisher's exact test) from 2 × 2 tables of allele counts and disease status. The percentage of allele frequency presented will be almost double, when the prevalence of HLA B in patients is anticipated as two different alleles per patient excluding few homozygous cases. The study was approved by the ethics committee of the SDM College of Medical Sciences and Hospital. Informed written consent was obtained from all patients prior to their enrollment in this study. In our study group of 105 patients with AS, males were more frequently affected than females (male:female ratio of 3.4:1). Duration of the disease at the time of diagnosis ranged from 1 year to 5 years. Out of 105 patients, only 22 showed positive for HLA and positive family history of AS was recorded in 25 patients (24%) [Table 1]. The predominant initial symptom was an inflammatory low back pain, sacroiliac joint involvement was observed in almost all patients with 92% demonstrating peripheral arthritis. Our HLA-B allele sequencing study revealed that both AS and controls together comprising of total 23 different alleles. 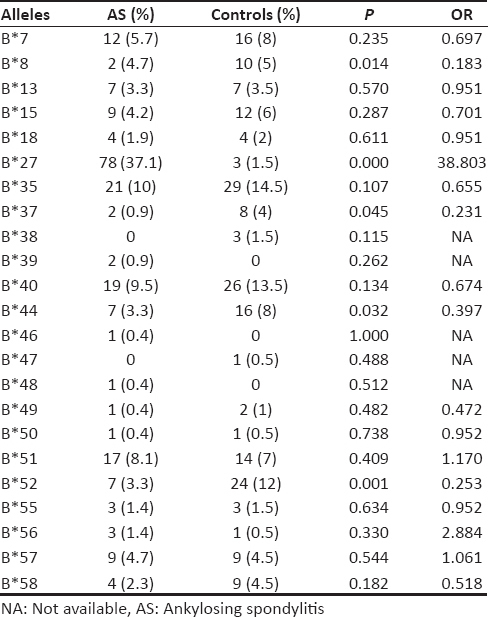 Major common alleles identified in controls are B*35, B*40, and B*52 with corresponding allele frequency of 29%, 27%, and 24%, respectively as shown in the [Table 2]. The current study confirms the well-established association of AS with HLA-B*27 in South Indian population, occurring in the frequency of 74%. The non-HLA B*27 alleles such as B*07 (11%), B*15 (8%), B*35 (20%), B*40 (19%), B*51 (16%), and B*57 (9%) demonstrated almost same frequency in control as well as in AS patients. On the other hand, other carrier alleles such as B*58 (P< 0.182), B * 52 (P< 0.001), B*44 (P < 0.03), B*8 (P < 0.014), and B37 (P < 0.045) frequency was significantly lower in patients with AS compared to control population. HLA-B*27 allele frequency in AS patients (74%) was significantly higher than healthy controls (3%). Current data illustrate that only 21% of AS patients presented HLA B*27 antigen positivity rather having 74% HLA-B*27 allele. This observation clarifies that even though HLA-B*27 phenotypes carry specific alleles, they may not be expressing the detectable quantity of antigens or the universally adapted flow cytometry screening method of detection of HLA antigen is not that specific. The data from the current population study [Table 3] demonstrated only four subtypes of HLA-B*27 (B*27:02, B*27:04, B*27:05 and B*27:07). Out of these, HLA-B*27:05 was most frequent (35% of the total patient pool) subtype followed by B*27:04 (23%) and further B*27:02 and B*27:07 were about 6% each. Control population showed the minimal presence of these genotypes as 1% each of B*27:04, B*27:05 and B*27:07. There were three cases of homozygous B*27 phenotypes noticed in the current AS study population without much altered clinical manifestations to the heterozygous group. In the current population study, HLA-B*40 allele association was found to be more in controls (23%) rather than in AS cases (16%). It is widely accepted that B27 antigen positive patients are likely to have active disease. In this respect, in the current study, we tried to correlate the different AS clinical manifestations with B*27 allele association. The age of AS onset in HLA-B*27 phenotype was early compared to non-HLA-B*27. In HLA-B*27 phenotypes, more patients were diagnosed in the 2nd decade (12–22 years, 28%) and in 3rd deacade (23–32 years, 42%). On the other hand, non-HLA-B*27 patients were diagnosed more in the latter period (after 33 years). All the patients included in the study had axial involvement [Table 4], HLA-B*27 associated AS patients predominantly demonstrated the severe axial manifestations such as bilateral sacroiliitis (84%, P < 0.0001) and erosion in the sacroiliac joint (76%, P < 0.001). As shown in [Table 5], non-HLA-B*27 phenotypes presented unilateral sacroiliitis (P < 0.05) with few erosion cases. Peripheral manifestations were not specific to HLA-B*27, even non-HLA-B*27 phenotypes demonstrated these manifestations. Very few cases of extra-articular manifestations were diagnosed, out of these few identified uveitis cases was predominantly present in HLA-B*27 phenotypes, followed by inflammatory bowel disease in two patients and psoriasis in four patients. All patients with inflammatory bowel disease and psoriasis were HLA-B*27 negative. The B*27 alleles identified in this study, B*27:02, B*27:04, B*27:05 and B*27:07 are shared by Caucasians and Asians (North, West and East) but not by West Africans (B*27:03) and North Europians (B*27:08). The major alleles identified in our study B*27:05 and B*27:04 are observed in Eastern Siberian population, North America, North Europian, and South China descent. It is very difficult to resolve the evolutionary history of HLA subtype diversity in Indian population, as they show closer association with Indo–European speaking population of Central Asia. Even though the current study is able to reflect the HLA B*27 allele picture in South Indian AS patients, It has a limitation of small sample size, further study with a higher number of patients is required to confirm the prevalence of HLA B*27 in general South Indian population. The current study indicates that a majoirty of South Indian AS patients are associated with HLA-B*27 alleles and in that HLA-B*27:05 and HLA-B*27:04 are predominant subtypes. Early-onset of AS manifestations is seen in HLA-B*27 phenotypes than non-HLA-B*27 phenotypes. HLA-B*27 associated AS patients presented more severe axial manifestations like bilateral sacroiliitis and sacroiliac joint erosion and extra-articular uveitis than non-HLA types. The authors would like to acknowledge the help rendered by Jeevan Stem cell foundation, Chennai, India, and Mr. Leonard Clinton D'souza for technical assistance. This work was supported by seed funding from Arthritis Super speciality center Hubli. Carter JD, Hudson AP. Reactive arthritis: Clinical aspects and medical management. Rheum Dis Clin North Am 2009;35:21-44. Brown MA. Progress in the genetics of ankylosing spondylitis. Brief Funct Genomics 2011;10:249-57. Akkoc N, Khan MA. Etiopatogenic role of HLA-B27 alleles in ankylosing spondylitis. APLAR J Rheumatol 2005;8:146-53. Reveille JD. Major histocompatibility genes and ankylosing spondylitis. Best Pract Res Clin Rheumatol 2006;20:601-9. Bjorkman PJ, Saper MA, Samraoui B, Bennett WS, Strominger JL, Wiley DC, et al. Structure of the human class I histocompatibility antigen, HLA-A2. Nature 1987;329:506-12. Loll B, Zawacka A, Biesiadka J, Rückert C, Volz A, Saenger W, et al. Purification, crystallization and preliminary X-ray diffraction analysis of the human major histocompatibility antigen HLA-B*2703 complexed with a viral peptide and with a self-peptide. Acta Crystallogr Sect F Struct Biol Cryst Commun 2005;61:372-4. Powis SJ, Santos SG, Antoniou AN. Biochemical features of HLA-B27 and antigen processing. Adv Exp Med Biol 2009;649:210-6. “IPD-IMGT/HLA” Database. Available from: http://www.ebi.ac.uk/ipd/imgt/hla/docs/release.html. Peschken CA, Esdaile JM. Rheumatic diseases in North America's indigenous peoples. Semin Arthritis Rheum 1999;28:368-91. Boyer GS, Templin DW, Bowler A, Lawrence RC, Heyse SP, Everett DF, et al. Class I HLA antigens in spondyloarthropathy: Observations in Alaskan Eskimo patients and controls. J Rheumatol 1997;24:500-6. Bowness P. HLA-B27. Annu Rev Immunol 2015;33:29-48. Khan MA. HLA-B27 and its subtypes in world populations. Curr Opin Rheumatol 1995;7:263-9. Taurog JD, Dorris ML, Satumtira N, Tran TM, Sharma R, Dressel R, et al. Spondylarthritis in HLA-B27/human beta2-microglobulin-transgenic rats is not prevented by lack of CD8. Arthritis Rheum 2009;60:1977-84. Reveille JD, Hirsch R, Dillon CF, Carroll MD, Weisman MH. The prevalence of HLA-B27 in the US: Data from the US National Health and Nutrition Examination Survey, 2009. Arthritis Rheum 2012;64:1407-11. García-Fernández S, Gonzalez S, Miña Blanco A, Martinez-Borra J, Blanco-Gelaz M, López-Vazquez A, et al. New insights regarding HLA-B27 diversity in the Asian population. Tissue Antigens 2001;58:259-62. Ma HJ, Hu FP. Diversity of human leukocyte antigen-B27 alleles in Han population of Hunan province, Southern China. Tissue Antigens 2006;68:163-6. Hou TY, Chen HC, Chen CH, Chang DM, Liu FC, Lai JH, et al. Usefulness of human leucocyte antigen-B27 subtypes in predicting ankylosing spondylitis: Taiwan experience. Intern Med J 2007;37:749-52. Gonzalez-Roces S, Alvarez MV, Gonzalez S, Dieye A, Makni H, Woodfield DG, et al. HLA-B27 polymorphism and worldwide susceptibility to ankylosing spondylitis. Tissue Antigens 1997;49:116-23. Varnavidou-Nicolaidou A, Karpasitou K, Georgiou D, Stylianou G, Kokkofitou A, Michalis C, et al. HLA-B27 in the Greek Cypriot population: Distribution of subtypes in patients with ankylosing spondylitis and other HLA-B27-related diseases. The possible protective role of B * 2707. Hum Immunol 2004;65:1451-4. Gonzalez S, Garcia-Fernandez S, Martinez-Borra J, Blanco-Gelaz MA, Rodrigo L, Sanchez del Río J, et al. High variability of HLA-B27 alleles in ankylosing spondylitis and related spondyloarthropathies in the population of Northern Spain. Hum Immunol 2002;63:673-6. Ben Radhia K, Ayed-Jendoubi S, Sfar I, Ben Romdhane T, Makhlouf M, Gorgi Y, et al. Distribution of HLA-B*27 subtypes in tunisians and their association with ankylosing spondylitis. Joint Bone Spine 2008;75:172-5. Shankarkumar U. HLA-B27 allele diversity in Indians: Impact of ethnic origin and the caste system. Br J Biomed Sci 2003;60:223-6. Kankonkar SR, Raikar SC, Joshi SV, Tijoriwala SJ. Association of HLA B27 antigen in Indian patients of ankylosing spondylitis and other autoimmune diseases. J Assoc Physicians India 1998;46:345-50. Akkoc N, Khan MA. ASAS classification criteria for axial spondyloarthritis: Time to modify. Clin Rheumatol 2016;35:1415-23. Chung HY, Machado P, van der Heijde D, D'Agostino MA, Dougados M. HLA-B27 positive patients differ from HLA-B27 negative patients in clinical presentation and imaging: Results from the DESIR cohort of patients with recent onset axial spondyloarthritis. Ann Rheum Dis 2011;70:1930-6. Malaviya AN, Mehra NK, Adhar GC, Jindal K, Bhargava S, Batta RK, et al. The clinical spectrum of HLA-B27 related rheumatic diseases in India. J Assoc Physicians India 1979;27:487-92. Prakash S, Mehra NK, Bhargava S, Vaidya MC, Malaviya AN. Ankylosing spondylitis in North India: A clinical and immunogenetic study. Ann Rheum Dis 1984;43:381-5. Madhavan R, Parthiban M, Rajendran CP, Chandrasekaran AN, Zake L, Sanjeevi CB, et al. HLA class I and class II association with ankylosing spondylitis in a southern Indian population. Ann N Y Acad Sci 2002;958:403-7. Chopra A, Raghunath D, Singh A. Spectrum of seronegative spondarthritides (SSA) with special reference to HLA profiles. J Assoc Physicians India 1990;38:351-5. López-Larrea C, Sujirachato K, Mehra NK, Chiewsilp P, Isarangkura D, Kanga U, et al. HLA-B27 subtypes in Asian patients with ankylosing spondylitis. Evidence for new associations. Tissue Antigens 1995;45:169-76. Chhaya SU. HLA-B27 polymorphism in Mumbai, Western India. Tissue Antigens 2005;66:48-50. Xing J, Watkins WS, Hu Y, Huff CD, Sabo A, Muzny DM, et al. Genetic diversity in India and the inference of Eurasian population expansion. Genome Biol 2010;11:R113. Sengupta D, Choudhury A, Basu A, Ramsay M. Population stratification and underrepresentation of Indian subcontinent genetic diversity in the 1000 genomes project dataset. Genome Biol Evol 2016;8:3460-70. Bittles AH. Endogamy, consanguinity and community genetics. J Genet 2002;81:91-8. Matzaraki V, Kumar V, Wijmenga C, Zhernakova A. The MHC locus and genetic susceptibility to autoimmune and infectious diseases. Genome Biol 2017;18:76. Brown MA, Jepson A, Young A, Whittle HC, Greenwood BM, Wordsworth BP, et al. Ankylosing spondylitis in West Africans – Evidence for a non-HLA-B27 protective effect. Ann Rheum Dis 1997;56:68-70. Liu Y, Jiang L, Cai Q, Danoy P, Barnardo MC, Brown MA, et al. Predominant association of HLA-B*2704 with ankylosing spondylitis in Chinese Han patients. Tissue Antigens 2010;75:61-4. Kim TJ, Na KS, Lee HJ, Lee B, Kim TH. HLA-B27 homozygosity has no influence on clinical manifestations and functional disability in ankylosing spondylitis. Clin Exp Rheumatol 2009;27:574-9. Mishra MN, Singal V. Human leukocyte antigen B27 in 453 Asian Indian patients with seronegative spondyloarthropathy. Iran J Immunol 2010;7:252-6. Díaz-Peña R, Vidal-Castiñeira JR, López-Vázquez A, López-Larrea C. HLA-B*40:01 Is Associated with Ankylosing Spondylitis in HLA-B27-positive Populations. J Rheumatol 2016;43;1255-6. Feldtkeller E, Khan MA, van der Heijde D, van der Linden S, Braun J. Age at disease onset and diagnosis delay in HLA-B27 negative vs. Positive patients with ankylosing spondylitis. Rheumatol Int 2003;23:61-6. Van den Bosch F. Ankylosing spondylitis and extra-articular manifestations. Eur Musculoskelet Rev 2007;25-6.